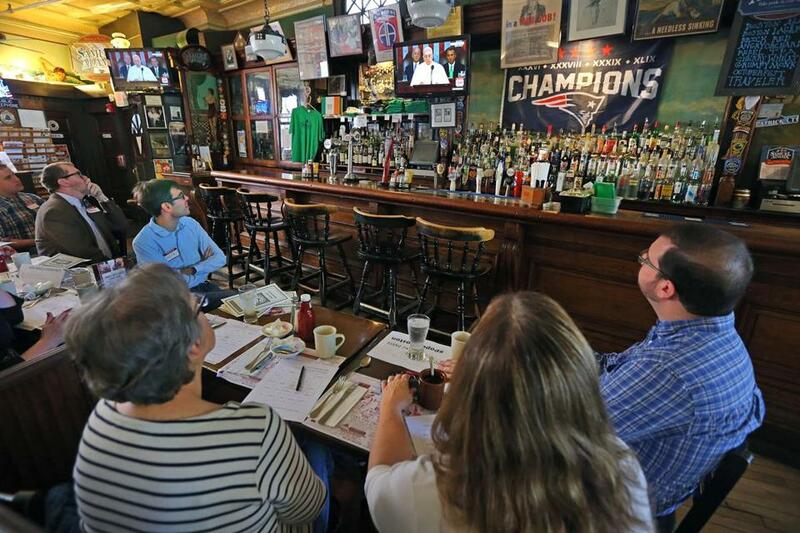 About 25 people gathered Thursday at Doyle’s Cafe to watch Pope Francis. Formally, the event was a gathering of some 30 clergy, activists, and lay people from across denominations to listen to Pope Francis address a joint meeting of Congress. 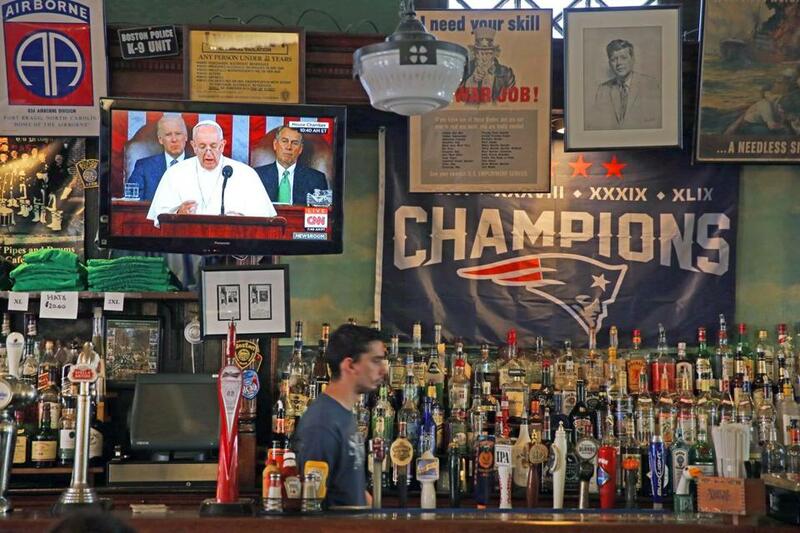 Informally, this was “Popeapalooza,” the holiest of ragers, convened Thursday at Doyle’s Cafe in Jamaica Plain. Christine Burns, associate pastor of the West Parish of Barnstable church, drove from Cape Cod, skipped work, and asked a friend to create an ecclesiastical stole, modeled off Pope Francis. The vast majority of those attending “Popeapalooza” came from outside the Roman Catholic faith, but strongly identified with the pope’s message of social justice and concern for the poor. During the speech, applause broke out for Pope Francis’s call for sympathy for immigrants, abolition of the death penalty, and his mention of Catholic activist Dorothy Day. But some watchers noted their disappointment that Francis did not mention women’s rights or offer a more expansive critique of Western capitalism, as he has done elsewhere. Thursday’s speech in Washington, D.C., struck a more conciliatory tone. “I had serious dislike of other popes, but [Pope Francis] has done the best job in my lifetime of living out the gospel,” said Burns, the associate pastor of the Barnstable United Church of Christ congregation. Marie Hurd, a former Catholic and current member of Old South Church in Copley Square, said Francis reminds her of the church she was raised in. Beginning about 9:45 a.m., Everett helped open the historic watering hole, dressing tables with bingo cards, pope paraphernalia, and asking that all televisions be set to cable news, which broadcast the address live. Everett knew Boston’s religious community would be watching the address, so why not watch it together? Several of Boston’s Catholic schools also planned pope-themed activities for the week, including Boston College High School in Dorchester and Pope John Paul II Academy in Mattapan. “Pope Francis spoke a message of unity in one of the most divided places in our nation, and that seems like a miracle,” Everett said, after the speech. Heather Angell, Lynn Cooper, and Cristina Lledo Gomez represented the room’s Catholic minority, but were probably the most vocal. At the mention of Dorothy Day, Cooper and Angell cheered so loudly others missed the fourth American whom Pope Francis honored, the Catholic monk and writer Thomas Merton. “He’s Christ-like,” Angell said, adding that Pope Francis is the first Catholic leader whose portrait adorns her home. Cooper said the pontiff’s appeal lies in his actions, not words. Lledo Gomez, a visiting research fellow at Boston College from Australia, said this pope’s inclusivity makes her proud to be a Catholic. As for the ambience, it also received rave reviews. Partygoers loved everything, from the clanging kitchen dishes to the raucous cars of Williams Street. Being one with the world around you is the Pope Francis way, Everett said, and the gathering reflected that. Plus, the Massachusetts Council of Churches footed the breakfast bill. “What better representation of the unity of the holy spirit?” Everett said to the group. With that in mind, and keeping with the papal theme, Burns ordered the eggs benedict. Bartender Brad Zygala at the bar.